Help! I found a tick on me! Am I going to get Lyme Disease? Anyway, that got me to wondering about Lyme disease. What should you do if you’ve been bit by a tick? Ticks can attach to any part of the body, but are often found in hard-to-see areas such as the groin, armpits, and scalp. 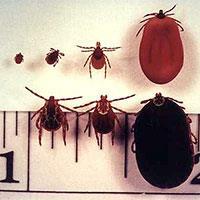 A tick must be attached for 36-48 hours or more before the disease is transmitted. If you find a tick on yourself, after you have finished panicking, get a pair of tweezers. Grasp the tick as close the skin’s surface as possible. Pull upward with steady, even pressure until you have removed the tick. Thoroughly clean the bite area and your hands with rubbing alcohol, iodine, or soap and water. If you had a tick bite, live in an area known for Lyme Disease, or have recently travelled to such an area and you experience any of these symptoms, seek medical attention! Make sure you tell your doctor that you have had a recent tick bite. Your doctor will prescribe antibiotics which should allow you to recover rapidly and completely. I live in a dorm – can I have my medications shipped to me? Used to be, you took your prescription to the pharmacy, they filled it, and that was that. Now, however, many insurance companies are requiring that ongoing medications – those you take month after month – be ordered and filled through a mail order pharmacy. That works great – but where do you have your medications shipped if you live in a dorm? I checked with Student Life Housing to see if medications could be sent to a dorm address. The answer is yes. Make sure that your name and dorm address is correctly identified to the mail order company to ensure correct delivery. If, however, you have a medication that requires refrigeration or perhaps you are on a particularly expensive medication, or maybe you’re just not comfortable with having your meds sent to your dorm, we here at Student Health Services can help you out. You can ship your medications to our pharmacy. Just give them a call at 614-292-0125 and let them know you’d like to have your medications shipped to them. When your medications are received, they will notify you so that you can come and pick them up.